I’m pleased to announce that last year’s Advent Calendar, hosted by the one and only Gonzo, has returned to All British Casino with the first casino promotion already available. 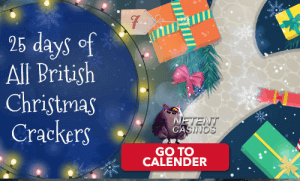 Until the 25th of December, All British Casino will be releasing extraordinary offers each and every day as part of the Christmas Advent Calendar. Just follow Gonzo on his festive quest across the snowy plains where he will guide you to your next offer including Christmas free spins, NetEnt bonuses, casino cash backs, and much more. I’ve seen quite some Christmas promotions in the past eight years and nothing seem too crazy anymore, but I’m happy to see The Gonz wondering through the snow again in order to lead you to your next casino promotion. Let’s be fair, we all love Gonzo and there’s no better host than this cool fellow. Well done to All British Casino for that! The great thing about the Christmas Advent Calendar is that a new Christmas Casino promotion will be available every day and all you have to do is to follow Gonzo. Once you’ve found out what the Christmas promo of the day is, you can decide what step to take next. Sometimes a deposit is necessary in order to participate in the promotion, but often all you have to do is to log into your All British Casino account or to play a certain game with real money. 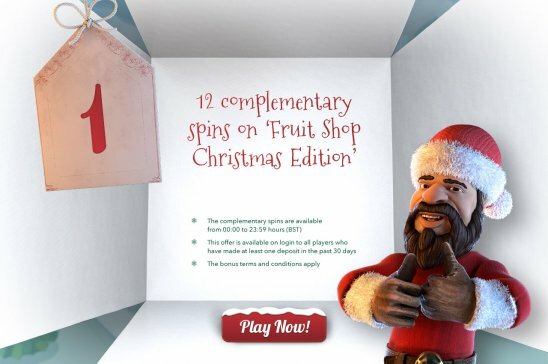 As always, All British Casino has a focus on the NetEnt slot and therefore you can also enjoy promotions for the Secrets of Christmas™ slot, Fruit Shop Christmas Edition™, and Flowers Christmas Edition, but that’s not all. You’ll also have a chance to receive cash backs and casino bonuses which makes a great mix of great Christmas Casino Promotions. From today, until the 25th of December, you’ll be able to benefit another Christmas Casino Promotion at All British Casino. The best way to check what All British Casino has in store for you is by visiting the Advent Calendar each day. Each promotion will run between 00.00 and 23.59 BST. 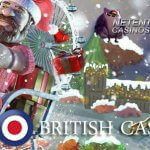 It seems that All British Casino and Santa have been in contact, truly knowing what players have been wishing for. That’s how you can look forward to a total of more than 500 complementary spins, tons of separate deposit bonuses, cashback bonuses as well as additional rewards on your wins where you can get rewards of between £250 and £500. 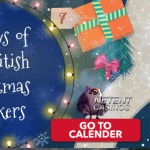 I’ll do my best to keep you updated with the best Christmas Casino Promotions at this British online casino and since today is the first day the Christmas Advent Calendar is available, I already have one very attractive promotion available. So let’s see what All British Casino has in mind for its players today and how you can benefit, no matter if new to this NetEnt Casino or not. 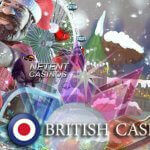 As you can see in the above image, 12 Complementary Spins are waiting for you at All British Casino today. These will be available for the Fruit Shop Christmas Edition™ until the clock (23:59 BST) turns the 1st December into 2 December. That it’s worth to make a deposit at All British Casino if you didn’t do that yet, this promotion shows as the above 12 Complementary Spins will only be available to all players who made at least one deposit in the past 30 days. If you don’t belong to this group of players yet, make sure you will as soon as possible as more of these Christmas Casino Promotions will be available at All British Casino this month. No worries you end up with empty hands today as a very generous welcome offer will be waiting for all new players at All British Casino including a huge 100% welcome bonus and a massive 100 free spins for Starburst™, Pyramid™ or Aloha!™.